Marcus, we finally have the system up and running with the heater/chiller that we purchased from you. To make a long story short, the original way we had decided to hook this up was not going to work as well as it should. We ended up making it a recirculating system and it should work great. We have played with the system running it through different scenarios and I don't think we are going to have any problems over wintering our fish. We added a head tank and two pool pumps. One of the pool pumps has a sand filter attached and pumps water back to the head tank. The other pumps from the head tank to the heater/chiller and out to our round tanks.I also added a flow meter inline to the pump so I can make sure we stay within the allowed flow range for the heater/chiller. I have added a few pictures so you can get an idea of what we have. Thanks for all your help. This series is designed specifically to meet all the Aquaculture and Agricultural needs. They are available in all electrical requirements from 200 volts to 575 volts, from single phase to 3 phase and also 50 or 60 hertz. Features an oversized Titanium Heat Exchangers for maximum heat output, larger evaporator coils with increased air flow for improved performance on colder days and full flow plumbing system to handle the highest water volumes without a significant pressure drop. Finally a heat pump designed specifically for the aquaculture industry! How do Hydro Royal Aquaculture Heat Pumps compare with other heat pumps? With over 30 years of heat pump heater design experience, Hydro Royal Aquaculture Heat Pumps are built to outperform the competition. Advanced micro-computer technology and exclusive design features result in 25% more heating performance than other leading heat pumps. 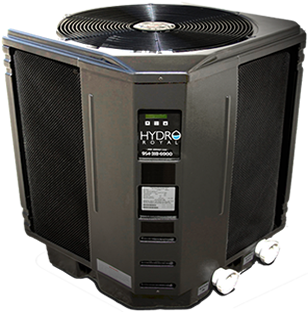 Unlike most other heat pump heaters, which use off-the-shelf components, Hydro Royal Aquaculture Heat Pump uses components specifically designed for optimum performance. This means higher efficiency and lower operating costs than competitive heat pumps. All Hydro Royal Aquaculture Heat Pump heaters are equipped with our Turboguard heat exchanger for long life and high performance. In addition, with its unique micro-computer technology, aquaculture heat pumps operate most cost-effectively throughout the full range of operating conditions, significantly outperforming the competition in the critical 40-60 degree air temperature range. What does the aquaculture titanium heat exchanger offer? The turbo titanium heat exchanger is designed to be used in breeder heat pump heaters. The name reflects (2) key aspects of the heat exchanger's design. "Turbo" reflects the enhanced surface turbo action of the water and freon in the heat exchanger and the nature of the fusion blended alloy material used to guard against or prevent corrosion of the heat exchanger. What is enhanced surface tubing? 3-4 times the surface area over a given length versus standard round tube (more surface area equals more heat transfer and a more compact design). More heat transfer equals more efficiency which equals lower operating costs for the owner. Turbulating action of the water as it swirls around the twisted tube (water simply passes over round tube in a straight line). The turbulating action of the water increases heat transfer and acts as a self cleaning mechanism, eliminating scale and corrosion on the surface of the tube. The net result is significantly lower operating costs. What is 24 hour auto heat? 24 hour auto heat is a feature that efficiently maintains your desired temperature 24 hours a day. It eliminates the need for an old time clock, replacing it with its own integrated filter/pump controller. The system divides your programmed filter pump run time into six (6) equal periods, this allows the breeder heat pump to sample the water temperature and add heat if needed keeping your desired water temperature precisely where you want it. Hydro Royal heat pumps have a national warranty in the Continental USA, Puerto Rico and Canada of 2 years labor, 10 years parts (prorated from the third to the 10th year) Lifetime on the titanium heat exchanger. Testimonial video provided by aquaculture facility using a Hydro Royal heat pump for heat and chill. We offer customer phone/video courtesy assistance and evaluation from your job site via Skype. Click here for more information about our Courtesy Heat Pump Help Program. We are more than just another heat pump company, we want to help you successfully complete your Aquaculture, Agricultural project with the least amount of possible stress.